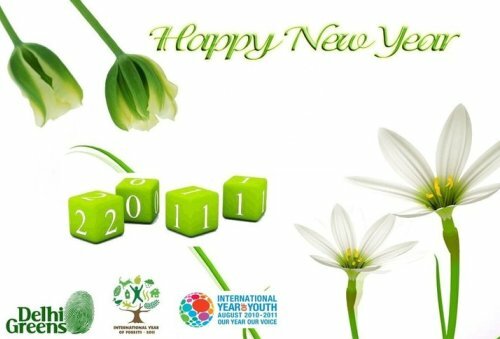 Welcome New Year 2011: International Year of Forests and More! Already in the first week of 2011 and looking good, Delhi Greens wishes everyone heartiest greetings and success all through the year. 2011 is special for Delhi as it completes a century of being the National Capital. Situated at the beautiful and strategic confluence the Delhi Ridge (which offered protection) and the Yamuna River (which provided water, critical for the survival of any civilization), Delhi has been a capital of choice since ancient, even mythological times! These landscape features are, until date, the lifelines of Delhi, though we are not giving them the respect they deserve. It is about time we understand the importance of this natural heritage and the ecosystem services they provide to us. The United Nations General Assembly has declared 2011 as the International Year of Forests to raise awareness on sustainable management, conservation and sustainable development of all types of forests. The idea is to celebrate forests for people! The Delhi Ridge, the tapering end of the Aravalli hills, has blessed the city with some splendid city forests ensuring good tree cover. Delhi Greens joins hands with the United Nations in celebrating these forests of Delhi all through 2011. Promoting the ecosystem services provided by the North, Central, South-Central and Southern Ridge will remain a central focus of Delhi Greens’ activities this year. The year 2011 is also being marked as the International Year of Chemistry, to celebrate the achievements of Chemistry and its contribution to the well-being of humankind. The celebrations involves several global experiments, of most interest being that on ‘Water as a chemical solution’. This is a good opportunity to come together globally and explore one of the Earth’s most critical resources, water. Delhi Greens will take this opportunity to explore the Delhi-water relationship, especially with respect to River Yamuna. The public understanding and appreciation of the river, with respect to their health and survival will be emphasized through 2011. 2011 is without doubt the year of Delhi, and 100 years of it being the national capital, it is time now to re-establish it as the much more than ‘world class city’ that it is. Delhi Greens invites everyone to come together in this ‘Delhi Lifeline celebration 2011’. We will roll out more information on this on a regular basis through this blog and lets hope together we will be able to ensure a sustainable urban development of the most majestic city of all times!